Create a clean, finished look with this plastic drain cover for your Bellwether shower base. Designed to fit snugly over the top of the recessed drain, this removable drain cover enhances comfort by keeping water from pooling underfoot and simplifies cleaning and maintenance. For use with Bellwether 60 inch x 34 inch shower bases. L'esthitisme transitionnel de la collection Archer est obtenu en combinant les techniques subtiles de chanfreinage des mantres artisans aux facettes raffinies de la joaillerie. Cette combinaison d'arjtes biseauties et de bases incurvies crie un attrait intemporel qui peut s'adapter ` nombre de motifs. With its beveled edges and clean geometry, this Archer shower base offers a spacious showering platform that suits an array of bathroom styles. Designed for alcove installations, this square base comes equipped with a covered drain that adds a unique design element and enhances comfort. With its stylized lines and rich detailing, the Memoirs shower base brings updated traditional styling to the bathroom. This innovative neo-angle receptor makes the most of compact corner spaces, and features a textured floor pattern. Available in a palette of KOHLER colors to complement any decor. The Marble Factory's Engineered Granite shower base is solid, easy to clean and designed for hassle free installation and care. It is made from a mixture of polyester resins and natural stone fillers. It does not have the flex of acrylic bases and therefore is highly resistant to leaks and cracks. This base is ideal for any 3 walled shower installation and can be used with tile or any water resistant shower panelling. 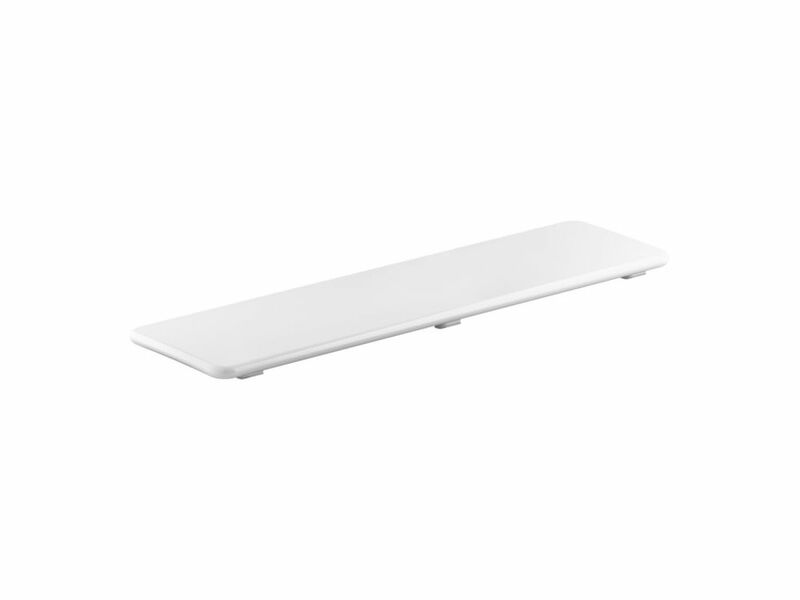 Bellwether Plastic Drain Cover For 60 inch X 34 inch Shower Base, White Create a clean, finished look with this plastic drain cover for your Bellwether shower base. Designed to fit snugly over the top of the recessed drain, this removable drain cover enhances comfort by keeping water from pooling underfoot and simplifies cleaning and maintenance.